Lavera Basis Sensitiv Hand Cream. Protecting and moisturising with organic almond & organic shea butter. Suitable for vegans. 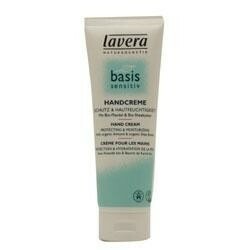 This hand cream is great,you only need a little as a little goes a long way. It absorbs really easily into you hands and has the most gorgeous sort of lemony sherbet sweet scent which makes you keep smelling your hands,i have never smelt anything like it,yum! It leaves hands so soft to the touch and feeling hydrated and nourished.